Filled with images of (what else!) beautiful dogs, this short documentary about Instagram canine photographer Elias Weiss Friedman aka The Dogist (1.8M followers!) also goes deep on the nature of creation in the digital age. Produced By Static Age, Inc.
Social media celebrities are still a relatively new phenomenon, and thus, we shouldn’t have too many assumptions of whom they should be, or how they should behave. Still, am I wrong to think that Elias Weiss Friedman, aka “The Dogist”, feels like an atypical Instagram star? Shouldn’t Instagram-famous people take lots of selfies, and be annoyingly confident and promotional? I would guess that very few people get to 1.8M followers without advertising or aggressive promotion, but The Dogist is one of them. Modest, self-effacing, and speaking in a low, but wryly funny monotone, Friedman cops to his status as an unlikely internet success story (complete with thriving publishing career), but through this engaging and entertaining profile doc, also reveals the flipside of his success — his isolation from people, and his shameful secret (he doesn’t even have a dog of his own!). The film is from SotW-fave E.J. McLeavey-Fisher, whom we admired greatly for Comic Book Heaven. E.J. is an NYC-based documentary and commercial director, and a long-time fan of The Dogist project, but only recently is he a dog-owner. When his own dog was photographed by Friedman, it was the opportunity he needed to ask Friedman about doing a profile. 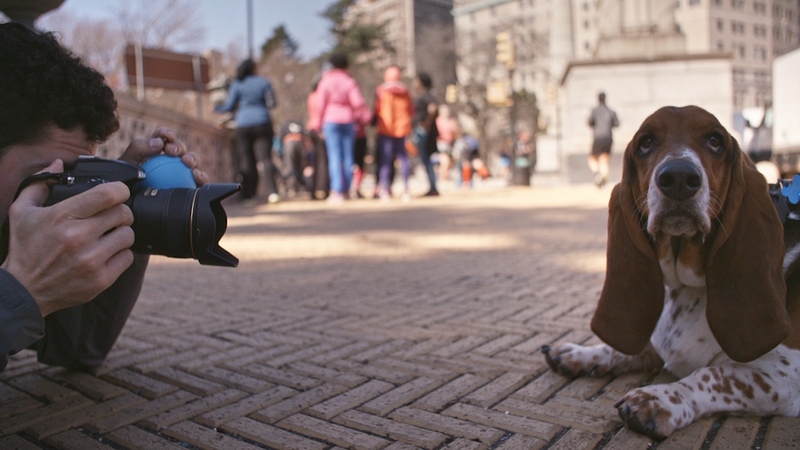 Shot over the entirety of 2015 in 3 separate sessions, the film seamlessly encapsulates the Dogist project, the momentous changes in Friedman’s life as his career took off, as well as beautifully capturing the city’s dog culture through the seasons. At a special screening of the film before its debut on the internet this week, we asked E.J. about the amazingly effective, yet subtle use of humor in The Dogist, and he was quick to credit Erik Auli, his editor. Specifically he called out how the sound of the film was crafted much more carefully than might be on a typical documentary. We’re big believers in the power of documentary editing, as seen in this video essay we did on the work of Max Joseph, and this film’s opening 45 seconds are a very good encapsulation of what E.J. was alluding to — the interplay of music and diegetic sound, the varying rhythm of quick cuts to slow, and the interplay of edit with the music to sharply sell visual punchlines. Even though The Dogist just dropped, we’re already wondering what Mcleavey-Fisher has next, and he informs us he’s working on another profile doc, this time of veteran Hollywood stuntman Brian Donahue. ETA is TBD on that, but we look forward to it. Additionally E.J. is working on his first screenplay!